The F-86 Sabre development began in 1944 but was delayed to include the new German swept wing design technology. 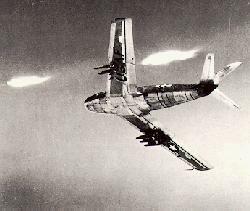 The F-86 also distinguished itself by using leading edge flaps to help maneuverability. By 1949 the F-86A had entered Air Force service. The F-86 was immediately used in the Korean war to counter the MiG-15. The MiG-15 had proven to be superior to the existing F-80 and F-84. The F-86 found its place in history for its ability to victoriously dog-fight the superior MiG-15. In the race to develop a jet fighter, North American Aviation obtained data on captured Messerschmitt Me 262s and closely examined the sweep of the German jet's wing. The company's project designers realized sweeping the wing backwards would allow higher subsonic speeds and delay the advance of the critical Mach number. Lt. General Bill Craigie, the Air Force officer in charge of developing the XP-86, decided the plane would have a 35-degree wing sweep. His decision changed a mediocre fighter into the United States' best fighter for the next decade. Design work on the XP-86 began in 1944. The original prototype had a straight wing and a flat fuselage. It differed from the competing Lockheed XP-80 by using an axial flow engine that permitted a straight passage of air from the nose intake to the exhaust. Unlike the German Me-262, which used unpowered leading edge slats, North American adopted automatic slats to make the jet a stable gun platform. The first flight of the XP-86 came on October 1, 1947. Although its engine was weaker than that of the Lockheed XP-80, the Sabre clearly flew better, and the government rushed to order it. Production models got a vital performance boost with the installation of the General Electric J47 engine; this power plant had 5,200 lbs of thrust and gave the Sabre a top speed of 692 mph. For years, rumors have persisted that XP-86 test pilot George Welch exceeded the speed of sound in a dive before Chuck Yeager's October 14, 1947 flight of the Bell X-1. 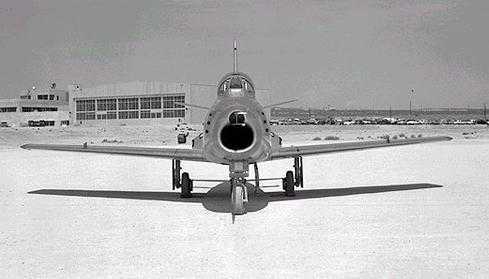 While this is possible - Sabre pilots would go on to break the sound barrier routinely - it is improbable. The first time the XP-86 officially went supersonic was on April 26, 1948. Fittingly enough, the first unit to receive these impressive jet fighters was the 94th, Capt. Eddie Rickenbacker's old Hat in the Ring squadron. The MiG-15 was designed as a high-altitude bomber interceptor. Armed with two slow-firing 23 mm cannons and powered by a Russian version of the Rolls-Royce Nene engine, the plane flew well but had tricky performance characteristics. The MiG-15 tended to stall and spin from a tight turn, handled very poorly at high angles of attack and, most critically, tended to snake at high Mach numbers, imparing it as a gun platform. During the Korean War, however, MiGs vastly outnumbered Sabres. An even greater advantage for the Comunist pilots was " MiG Alley," a sanctuary provided by the Yalu River, the border between China and North Korea. Here the MiGs could take off from Chinese airfields and climb to altitude on the Communist side of the border, immune from U.S. attack. Then, if they chose, the MiG pilots could make slashing, diving attacks from their higher altitude, strike a Sabre formation, and then dive back across the river to safety. It became a Sabre's challenge to lure them into combat. When the planes joined in combat, the Sabre's better maneuverability and its stability as a gun platform usually settled the issue. The F-86s all-flying tail, pioneered on the Bell X-1, gave the pilot far better control at high Mach numbers. By war's end, the tally would stand at 739 MiGs shot down versus just 78 Sabres' an almost 10-to-1 kill ratio. For more information on this aircraft please click here.